This section gives you a lot of information on how to bathe your dog and brush his coat. Patience and gentleness are key! "Regular bathing and grooming of your dog is important." Grooming keeps the dog's coat clean and healthy looking while allowing you to check the skin for signs of disease or parasites. Grooming of short-haired dogs should be about once a week but grooming of long haired dogs may need to be more frequent. Puppy bathing and grooming will need to be done with kindness and patience to allow your puppy to get used to each stage. It is a good idea to get everything prepared before you start to bathe your dog because he may try to get away from you during bathing! You will need to prepare the area where you will wash the dog, where you will dry him, and have the equipment you will need ready. Dogs only need bathing when they are dirty or on the advice of your veterinarian. Make sure that you only do this in fine weather or indoors to avoid chills. Use only products which have been designed for use on dogs. Never use a domestic detergent or disinfectant. Whenever you bathe your dog, his bedding should be aired and washed at the same time. This, of course, should also be done at regular intervals between baths. Bathing outdoors in warm weather may be the best place, because it can be a messy job. Have a tub or other container half filled with warm water - not too warm - and make sure you have a ready supply of warm water for rinsing the dog. You will need a mild shampoo such as baby shampoo or canine shampoo or your vet may have recommended a special type for your dog. Always read the instructions carefully before you use any shampoo on your dog. Have an old clean towel ready to dry your dog and, depending on the breed, you may want to use a hair dryer. Gently lift the dog into the container of tepid water. Do not attempt to lift the dog if he is too heavy, get someone to help you. Use a clean bottle or jug to pour the warm water over the dog, from the back of the neck downwards, doing the head last. Start by applying the shampoo to the body and legs. Rub the shampoo well in to the coat to give a good lather and make sure all the coat has been shampooed. The dog's head should be shampooed last, paying particular care to ensure that no shampoo gets into his eyes. Rinse the shampoo from your dog by pouring warm water on to his coat. It will take quite a lot of water to rinse the shampoo out of the coat thoroughly. Your dog will probably shake himself vigorously and this will remove most of the water from his coat. Use an old clean towel to dry off the remaining water. You can complete the drying of his coat by using the hair dryer on a low temperature setting. By using a brush with the hair dryer you can speed up the drying process considerably. Short-haired dogs may need to be groomed once a week depending on the condition of the coat. Start by getting everything together before you begin grooming your dog. A comb and a soft bristled brush will be needed which you should keep specially for your dog. For a large dog it may be best to stand him on a table outside so that you can groom him easily. For small dogs, sitting the dog on your lap may be the best way. Groom the dead hair out using the comb. Start from the head and work down the body, tail, and legs. 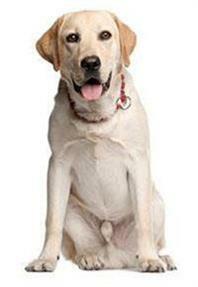 Pay particular attention to the thick hair of the neck, especially with breeds such as Labradors. Once you have groomed the coat thoroughly, use the soft bristled brush to remove any loose hairs. Long-haired dogs may need to be groomed several times a week. It is better to spend a short time every two or three days than to leave the coat ungroomed and encourage matted hairs. Start by getting everything together before you start grooming your dog. A comb and brush will be needed which you should keep specially for your dog. For a large dog, it may be best to stand him on a table outside so that you can groom him easily. For small dogs, sitting the dog on your lap may be the best way. Grooming is a good time to check your dog's coat for any skin rashes, lumps or parasites such as fleas and ticks. If any of these are found, see your vet for further advice. Groom the dog from the head downwards running the brush or the comb in the direction of the dog's hair. You may need to lift up the hair if the dog has a thick undercoat. Brush from under the coat outwards, removing dead hair and mats. If you can put the comb through the hair without it catching then you know that you have thoroughly groomed your dog. The most important thing about bathing and grooming your puppy is to be patient and gentle with him. If the puppy remembers the bathing as an unpleasant experience, he will become more difficult to bathe as he gets older. You can get the puppy used to being groomed and handled and accustomed to the equipment such as the combs and hair dryer. It is best to get everything prepared before you start to bathe your puppy because he may try to get away from you during bathing! This includes the area where you will wash the puppy, where you will dry it and the equipment you will need. Before bathing the puppy check his coat for any skin rashes, lumps and also parasites such as fleas and ticks. If any of these are found do not bathe the puppy and see your vet for further advice. A warm place will be important for bathing your puppy. Outdoors in warm weather may be the best place because it can be a messy job or somewhere indoors where all the splashing water won't do any damage. Have a tub or other container half filled with warm water- not too warm - and make sure you have a ready supply of warm water for rinsing. Always use a mild shampoo for your puppy. Read the instructions carefully before you use the shampoo. Have an old clean towel available to dry the puppy. "This is the best time to get your puppy used to a hair dryer." Never be rough with a puppy as he will not forget and may struggle every time he is bathed. Gently lift the puppy into the container of tepid water. Use a clean bottle or jug to pour the warm water over the dog, from the back of the neck downwards, doing the head last. Start by applying the shampoo to the body and legs. Rub the shampoo well in the coat of the dog to give a good lather and make sure the entire coat has been shampooed. The puppy's head should be shampooed last, paying particular care to ensure that no shampoo gets in to its eyes. Rinse away the shampoo by pouring warm water on to its coat. It takes quite a lot of water to rinse the shampoo out of the coat thoroughly. Your puppy may shake himself vigorously and this will remove most of the water from his coat. Use an old clean towel to dry off the remaining water. This is a good time to get your puppy used to a hair dryer. You can complete the drying of his coat by using the hair dryer on a low temperature setting. By using a brush with the hair dryer you can speed up the drying process considerably. Remember the puppy may not be used to grooming so be patient and gentle if he is frightened. Puppies may need to be groomed once a week depending on the condition of the coat. Get everything together before you start grooming your puppy. A comb and a soft-bristled brush will be needed which you should keep especially for your puppy. For a large puppy it may be best to stand him on a table outside so that you can groom him easily. Do not attempt to lift the puppy if he is too heavy or boisterous, get someone to help you. For small puppies sitting him on your lap may be the best way. Groom the dead hair out using the comb. Start from the head and work down the body, tail, and legs. Pay particular attention to the thick hair around the neck, especially with breeds such as Labradors. Once you have groomed the coat thoroughly, use the soft bristle brush to remove any stray hairs.